If you have a small business and you want to take it online or you want to make it suitable for internet users, then we will be giving business ideas on how to make the small scale business a success one through the internet. All businesses can be suited for Internet marketing, especially if your business serves a local community. To the business minded people, the internet is a big market place where your local product could get recognition, exposure and order with brings steady income. 1. Build a Website : The best way to give your small business a lift, an exposure, popularity using the internet is a build a website or blog for it. The days when you spend so much to have an official website is over because you can now build free website for your business for free using Blogger platform or WordPress. You just get a cheap domain name and hosting and there are template you can use to build the business site. You can then share links of your business website to people around you, your Facebook friends, Twitter followers and you even hire a webmaster to help you manage the website daily. 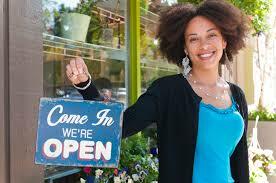 This is a good way to make your small business a success online. 2. Use Online Paid Adverts: To make your small business successful using internet, you can use paid adverts such as Facebook ads or Google Adwords to target the right audience for your business. Not only that, it will also help people from other areas, countries, region to know about your business which i believe it worth spending on. 3. Conduct Research : You can conduct some online research for your small business to know if there is an online market your product and services. You can contact some online product research companies to do that for you or you search Google to know how relevant your product can be to the people in other part of the world. It tells you if your product is fit for online marketing. 4. Integrate Online Payment Button: To make your small business a success online, you need integrate an online payment method for your product. Online users seems to be comfortable buying things. This can be achieved by displaying the images of your products on your blog or site with the price and mostly acceptable payment method based on their region. , but also make purchases. 5. Good Customer Services: You can create a good online presence for your business through communication such as newsletters, free gift, free downloads, announcing new product, free shipping and 24/7 fast customer care services. These are things that helps in online expansion is advisable you put them into consideration. It make your business successful online with more profit being generated when you product has the right target. Your small business will grow online if you have good marketing strategy, right strategy, less expensive products and many more. These are things that can help make you small business grow online, it makes it successful and more income are generated. Thanks for reading.